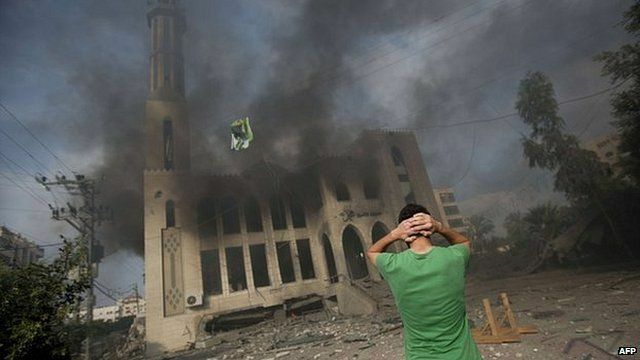 BBC inside Gaza mosque ruins Jump to media player As strikes continue in Gaza the mood amongst civilians is becoming one of 'defiance', Chris Morris reports. Father in Israel: 'We want it over' Jump to media player Udi Tischler from Ramat Gan near Tel Aviv tells the BBC how the conflict in Gaza is impacting on his and his family's life, as Israel warns of a long conflict ahead. Strike destroys Hamas leader's house Jump to media player Israeli airstrikes have hit Hamas-run Al-Aqsa television and radio building in central Gaza, and the house of the former Hamas Prime Minister, Ismail Haniyeh. Attacks claim ten Israeli soldiers Jump to media player Israel's army lost 10 soldiers on Monday - five when militants infiltrated the border, while an earlier mortar bomb killed four, a tenth dying in a clash in southern Gaza. Netanyahu warns of 'prolonged campaign' Jump to media player Speaking at a news conference in Tel Aviv, Israeli PM Benjamin Netanyahu warned of a "prolonged" Israeli campaign in Gaza. Children pay heavy price in Gaza Jump to media player A lull in violence in Gaza is shattered as deadly explosions hit the Palestinian territory's main city. Kerry urges 'humanitarian' ceasefire Jump to media player US Secretary of State John Kerry has called for a "humanitarian ceasefire" following his recent trip to the Middle East. Divided West Bank united in anger Jump to media player The conflict in Gaza has caused a rise in tensions in the West Bank and thousands have protested against Israel's actions in Gaza. More than 100 Palestinians are said to have been killed after Israel intensified its bombardment of Gaza and warned of a long conflict ahead. Gaza's only power plant caught fire as Israel carried out 60 air strikes, targeting sites associated with Hamas, the Islamist group which controls Gaza. Following the overnight strikes, Chris Morris met defiant citizen Basman Al-Ashi, who said that the world was failing Gaza. This report was edited on 7 October 2014 to correct an error.